Beijing bound in one week! Only a week to go now before heading to Beijing for the Olympic Games. The weather here in the UK has been fantastic so I opted to stay and train rather than go to Hungary on a training camp. Been a really fun time since the last World Cup with quite a few newspaper, TV and radio interviews done. It all adds to the excitement of the Olympics. I have some video blogs now here on the team GB website. 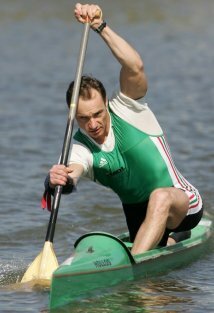 Sad news has just circulated that the legendary Hungarian former Olympic and World Champion canoe paddler Gyorgy Kolonics has died during a training session in Hungary. His name at least, was well known to all paddlers across the World and he always came across as a very humble and professional athlete whenever I met him. My deepest sympathy to his family, friends and especially his C2 partner who he had been training with to compete in what would have been his 5th Olympic Games.